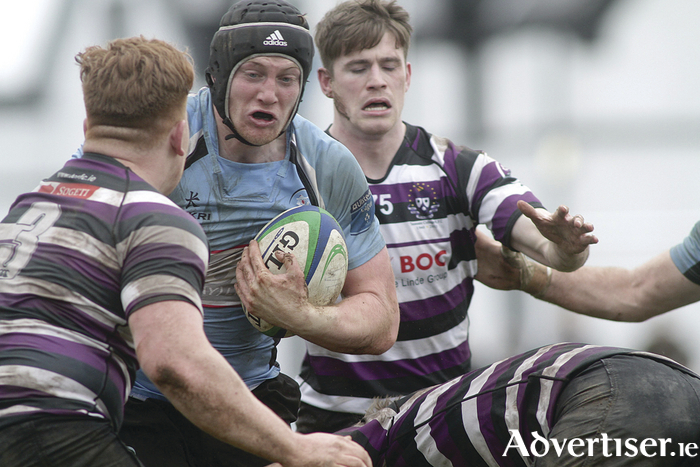 Galwegians hopes of staying in the top division suffered another major setback after conceding a late intercept try to Crowley Park visitors Terenure College on Saturday, losing by 10-14. Now Wegians face a daunting final game away to high-riding Cork Con on April 16 and look almost certain to be involved in a relegation play-off to avoid the drop into division 1B, and possibly needing a losing bonus point to avoid automatic relegation. With just one championship point between Terenure and Wegians, and the prospect of relegation hanging over both, it ensured an edgy and nervous encounter at Crowley Park on Saturday. The Blues looked the more threatening early on, dominating territory, but their game was littered with errors. While their set-piece and line-out malfunctiond at the wrong time, they were losing the battle of the breakdown, conceding penalties. Nor were they helped when losing openside Josh Pim, and also influential centre Brian Murphy after an unfortunate clash with Nure full-back James O’Donoghue. Having soaked up the early pressure, the visitors who struck first through left wing Matthew Burke, with right wing Jake Swaine converting. However the home side took the game again to the opposition and were rewarded just before the break. A chip ahead by outhalf Aidan Moynihan took a somewhat fortunate deflection, landing perfectly into the path of substitute winger Alan McMahon, who took his chance well to dive over in the left corner. Moynihan then landed the conversion into the breeze to level the game. Although the visitors upped the ante after the break, dominating territory in the third quarter, disciplined defence kept them out. When Moynihan put in an excellent block and hacked the ball deep into opposition territory, Nure substitute backrow Robert Duke was sin-binned in a desperate attempt to protect the Nure try line, and Moynihan landed the penalty to edge ahead 10-7. However with time running out, disaster struck when Galwegians, playing the ball out of their own half, lost possession and Swaine collected the loose pass to race home unopposed and converted for a four-point cushion. Galwegians XV: John Cleary; Ed O’Keeffe, Cormac Brennan, Brian Murphy, Adam Leavy, Aidan Moynihan, Barry Lee; Ja Naughton (capt ), Jack Dinneen, Jason East; Marty Cummins, Dave Nolan; Marc Kelly, Josh Pim, Anthony Ryan. Subs: Patrick Curran, David O’Connor, Matthew Towey, Peter Claffey, Alan McMahon.